ملاحسنی, امیر, تاج دینی, آژنگ, روح نیا, مهران. (1390). بررسی و تعیین عاملهای موثر بر تقاضای واردات الوار در ایران. مجله صنایع چوب و کاغذ ایران, 4(1), 101-116. امیر ملاحسنی; آژنگ تاج دینی; مهران روح نیا. "بررسی و تعیین عاملهای موثر بر تقاضای واردات الوار در ایران". مجله صنایع چوب و کاغذ ایران, 4, 1, 1390, 101-116. ملاحسنی, امیر, تاج دینی, آژنگ, روح نیا, مهران. (1390). 'بررسی و تعیین عاملهای موثر بر تقاضای واردات الوار در ایران', مجله صنایع چوب و کاغذ ایران, 4(1), pp. 101-116. ملاحسنی, امیر, تاج دینی, آژنگ, روح نیا, مهران. بررسی و تعیین عاملهای موثر بر تقاضای واردات الوار در ایران. مجله صنایع چوب و کاغذ ایران, 1390; 4(1): 101-116. الوارهای وارداتی در تامین نیازهای صنایع گوناگون سلولزی کشور دانست. of Forest, l2 ( 1):13-24 (In Persian). University of Tehran, 150 pages (In Persian). Islamic Azad University, 110 pages (In Persian). of Industrial Management, Tehran University. 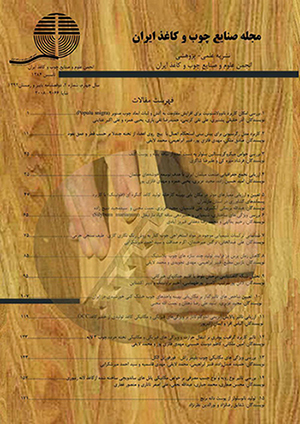 114 Pages (In Persian). bounds testing approach. Economic Researches,? (66):91-112 ( In Persian). economic. Journal of Trade Studies, 10(40):205-226(In Pesian). Mohammadi Limaei, S., Heybatian, R., Heshmatol Vaezin,S.M. and Torkman, J., 2011. Wood import and export and its relation to major macroeconomics variables in Iran. equilibrium market model .Journal of Forest Research, 7(1):41-48.
environment science Press USA Inc,81p. supply and trade in Europe. Food and Agriculture organization of the United Nations. Journal of World Development, 35(12):2150-2160. Department of Statistics and Information. 1978-2007. Iran Foreign Trade Annual Book. Islamic Republic of Iran‘s Customs. 785pp (In Persian). center of Iran. ( http://amar.sci.org.ir). / (In Persian). 1st Ed, Economic Research Institute, Tehran, Iran, 247p (In Persian). Tehran, Iran, 1065 p (In Persian). Colorado, United States of America, available at: ageconsearch. umn. edu/bitstream/60930/2/PAPER (60930). pdf (accessed 25 March 2012). System (Ground-Rout), Iranian Journal of Trade Studies, 14(57):115-154(In Persian). Department of Forest Science, Helsinki University, 52 pages.